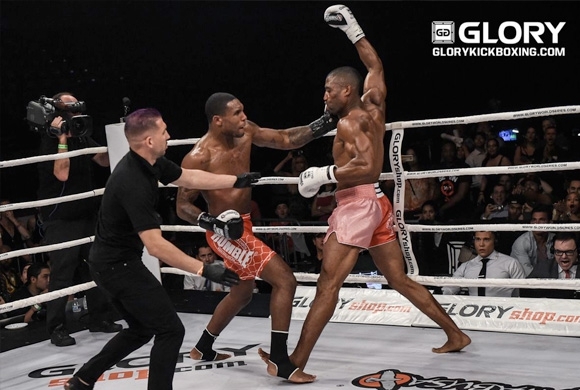 Simon Marcus regained the Glory Middleweight title belt at Glory 40 in Copenhagen on the 29th of April, edging out old adversary Jason Wilnis with a close, split decision victory, reclaiming the title 8 months after losing it to Wilnis by TKO in the third round. This time Marcus scored throughout with solid kicks to the body to edge out Wilnis at the end of 5 rounds. Yousri Belgaroui earned a shot at Marcus’s title by defeating Alex Pereira in the final of the Middleweight 4 man qualifying tournament, taking a clear points win at the end, after beating Agron Pretini also on points in his semi-final fight. Pereira stopped Burin Rama in the third round of his semi-final, but didn't have enough eft to trouble Belgaroui in the final.